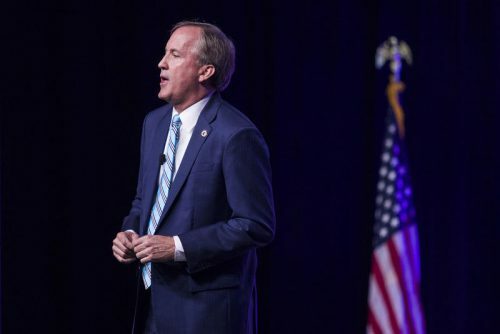 In a little-noticed court filing last month, Texas Attorney General Ken Paxton asked a federal judge to get rid of a popular part of the Affordable Care Act in Texas. In particular, his request could affect a part of the law that protects people with pre-existing conditions from being denied health insurance or being priced out of a health plan. Paxton wants the court to strike down the federal health care law in its entirety. In a July filing, though, he wrote that if it’s not completely invalidated, the court should allow insurance companies to treat people with pre-existing conditions in Texas and 19 other states differently. “That would mean that Texans could be excluded from insurance for having pre-existing conditions, but Californians would still be protected,” for example, Timothy Jost, a law professor at Washington and Lee University School of Law, said. According to the Kaiser Family Foundation, about 27 percent of Texans under 65 have a pre-existing condition, such as asthma, diabetes, high blood pressure, pregnancy and cancer. Earlier this year, 20 Republican-led states filed a lawsuit challenging the health law, also known as Obamacare. The lawsuit, led by Paxton, argues that a provision in Congress’ 2017 tax bill invalidates the entire health law. That provision removed the individual mandate, which requires people to buy health insurance. The U.S. Department of Justice decided in June not to defend the health care law in this case, so a group of states led by California stepped in and is defending it. Jost said Texas and the other plaintiff states are basically arguing that when Congress “zeroed out” the individual mandate tax, it also meant to get rid of those pre-existing condition protections. He says there’s no evidence that was Congress’ intent, though. “What kind of an attorney general would ask the court to invalidate protections for only the citizens of his state, as opposed to citizens of other states?” he said. “Texans should be free again to make their own healthcare choices, including which doctor they want to see,” he said in a statement. Health care experts say it is surprising that Paxton, who is running for re-election this year, is asking a court to strike down the most popular protection within Obamacare. “Most Democratic voters (74 percent), independent voters (64 percent) and half of Republican voters (49 percent) say a candidate’s position on continued protections for pre-existing health conditions is either the ‘single most important factor’ or a ‘very important, but not the most important factor,’ in their 2018 vote,” pollsters wrote. Anne Dunkelberg, an associate director with the Center for Public Policy Priorities, said it’s not surprising that this protection is popular because most people know someone who has a pre-existing condition. Most people understand that the protection could also benefit them at some point. Removing this provision of the law could also have a significant effect in Texas, which already has the highest number and rate of uninsured people in the country. Dunkelberg said Texans who buy insurance through the individual marketplace created by Obamacare would be the most affected — particularly if they don’t qualify for a generous subsidy. They would likely be priced out of a plan, she says. Plans for people who stay in the market would become more expensive. She says that could increase out-of-pocket costs for many people. “If companies started being able to charge more because of your health history or deny you because of your health history … the cost for the people remaining in the [insurance] pool would be go higher and higher,” she said. The case is before the U.S. District Court for the Northern District of Texas. Paxton asked for the court to consider removing the provisions the DOJ said are severable by the new year.